Posted by thegulfblog.com in North Africa. I’ve always liked flags and often wonder whether I ought to have been a professional vexillologist. 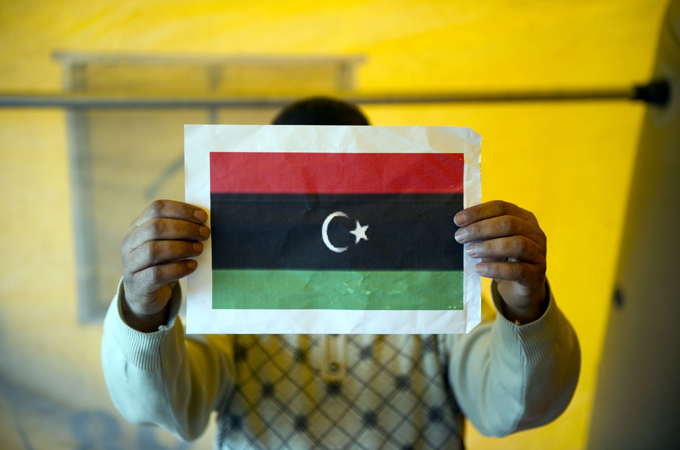 This is the flag being used by swathes of the opposition in Libya. It is the Libyan flag that was flown to celebrate independence from the Italians. It was finally taken down in 1969 to be replaced by a pan-Arab red, white and black tricolour, according to Al Jazeera. This in turn was replaced by the current all green flag, intimately associated with Gaddafi, in 1977. The red band on this flag, as ever, signals the blood of those who fought for freedom. The black band is thought to refer back to an older flag, the green band is for prosperity, apparently, [I’d have thought it would be Islam…] and the sickle and start represent the main religion, Islam (too?). Here’s hoping that this flag can be held aloft at the UN sooner rather than later. Thanks for the info..It realy helps on my personal project on libya..